This album has been a long time coming. 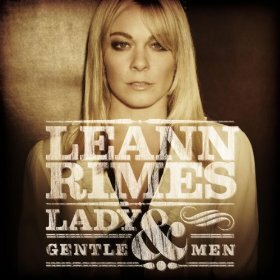 For the better part of the year, LeAnn Rimes has been releasing singles from her new album, Lady And Gentlemen. The album is LeAnn’s take on a few classic male songs with a few originals. The latest single release from the set is a completely new version of Vince Gill’s When I Call Your Name. LeAnn has been one of my favorite artists for some time. Strictly from a music standpoint I think she’s been one of the top singers in country music for a decade. Her voice is wonderful. She can sing classic country. She can sing modern country. And as is evidenced by When I Call Your Name, she can sing the blues with a little jazz mixed in for good measure. It’s a great version of the song. LeAnn’s When I Call Your Name is entirely different from Vince’s version. You might not even recognize the song if you didn’t know the lyrics. I like the direction LeAnn took this song. She seems to have all the talent in the world and sometimes doesn’t really know where she wants to take a song. It’s almost like there are too many options sometimes and her albums have come off as a little all over the place. With this track, though, I think LeAnn may have stumbled on this unique niche of jazz-country. The song seems like the kind you’d hear in a lounge somewhere deep in the southern part of the country. LeAnn has shown this kind of vocal ability for jazz before with her song Good Friend And A Glass Of Wine. I’m not sure how the country audience will receive a song like this, but I think it’s a good move for LeAnn nonetheless. Nobody is making songs like this right now and I think there’s an audience for it out there. I don’t think it’s a mainstream country audience, but LeAnn needs to find a little niche of her own right now and perhaps build up a strong following for her own jazz-country genre. It’s been 4 years since LeAnn Rimes had a hit of any substantial accord. It’s been 6 years since she’s had a hit in the top five. During that time she’s been recording and has released new music. She’s been out on tour. She’s been very busy. What’s been too bad is LeAnn has made a name for herself as a result of her pursuits in her personal life. I think sometimes we take for granted how young LeAnn Rimes was when we first got to know her. She was a star in her teens. She was married in her teens. Now she’s divorced and married once again. I’m hoping LeAnn has settled into a more mature place in her life now. She seems to be happy. Her voice sounds great. It’s time for the world to get to know LeAnn Rimes the country singer once again. Or perhaps the jazz-country singer.